It has been proposed that Online:Behemoth be renamed and moved to Online:Argonian Behemoth. 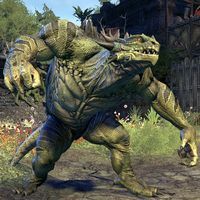 Behemoths are hulking, monstrous Argonians found in Murkmire. They have powerful melee attacks and can also spew poison. Deroh-Zah, the guardian of the Sacred Lily.